Where do you even start when it comes to planning Rio de Janeiro Carnival? Do you even have to plan for Carnival? What should you take with you? There are a lot of things to think of when planning your first trip to Rio. I wish I’d know a little more before I arrived on what I should wear, which hostel to go to, what was going on day and night, how you get around the city, how long I should stay for, what else you could do outside of Carnival. So many questions right? I have put together some of my best tips that will be incredibly helpful for any of you who are planning to visit Rio de Janeiro during Carnival. While in Rio over the Carnival week, I would definitely recommend visiting the Sambadrome. It’s where you can experience the biggest event and parade of the whole of Rio de Janeiro Carnival. Here you will see the Rio samba schools dance their heart out to compete in the greatest dance competition of Carnival. When you picture Carnival, what do you see? You will see it all here! You can buy your tickets online in advance or you can see if there are any once you arrive. Some hostels sell them or you can get them at the Sambadrome ticket pick up point. Read my post about the Sambadrome to see if it’s the event for you. Rio Carnival officially starts next year (2019) on the 1st March and goes on until the 9th March. Separate to the Sambadrome, there are also ginormous parades along Copacabana and Ipanema beach each afternoon. There are also hundreds of blocos taking place throughout the entire city – these you can hear through word of mouth. Find the official 2019 Carnival program here. 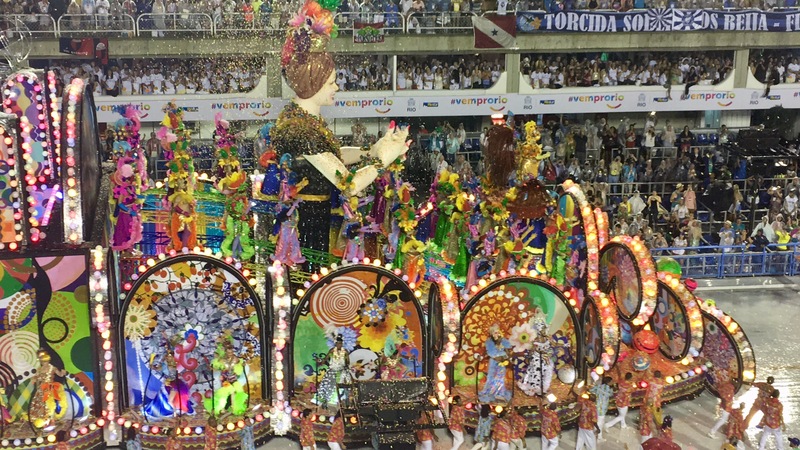 It is the Samba School’s finals that take place in the Carnival week at the Sambadrome. However, if you are in Rio in the weeks prior to Carnival and want to save some money, you can see these spectacular parades for free. Each weekend in the run up to Carnival, the samba schools battle it out to see who will make it to the finale weekend. Apparently the atmosphere is just as electric at these free parades so if you are there beforehand, 100% you should check it out. 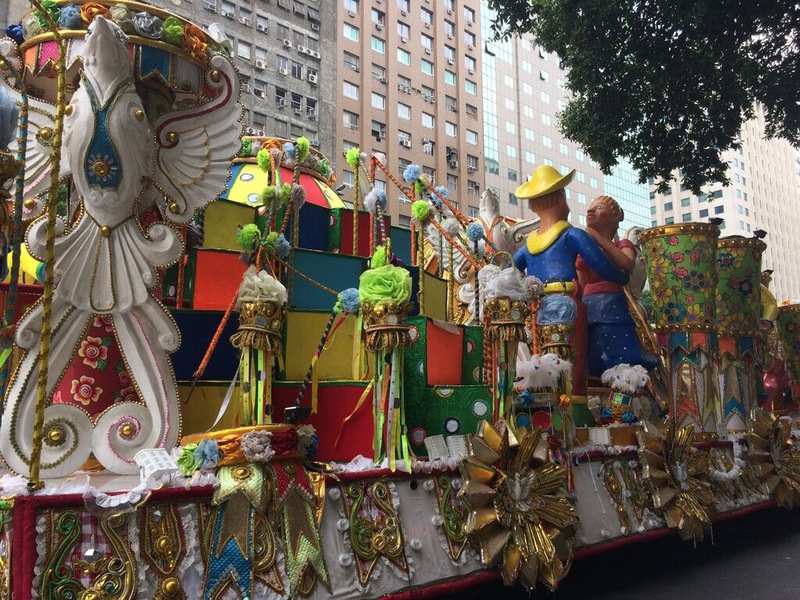 Let me know in the comments if you have been to these free parades, I’d love to know how they are. Blocos are organised or sometimes completely unorganised street parades throughout Rio de Janeiro in the weeks and months ahead and also during Carnival. Wherever there is music, crowds of people come together and celebrate their love for live music, dance and ice cold drinks in the sun. In some cases into the twilight hours. The usual set up for these blocos is hordes of people following an open top bus or a live band. It slowly moves through the crowds blasting out a 3 minute song on repeat for hours. On top of the bus there are people singing/shouting along over microphones while the people below shuffle forward to the beat and drinking refreshing sacolé – a frozen flavoured cachaça ice pop. Blocos are also known to continue in the streets after Carnival officially ends, making the celebrations easily a month long. You can come across blocos just by walking around the city and following the drumming. Word of mouth is by far the easiest way, most locals definitely know where to find the best ones. As well as the blocos, the streets come alive late at night. Bars overflow out on to the roads letting the vendors fuel the over spilling party goers. Music is blasting out all over, you just have to pick where you want to dance and drink. For the street parties, I would recommend taking your own alcohol as it works out a little cheaper. If you can find something like our pineapple jugs to put your concoction in, perfect! If you don’t want to carry a big bottle of mixed drink, you can buy cold beers for R$2 off the street, sacolé or cocktails for R$5. Happy Hour deals at hostels are usually R$8-10 for 2 small caipirinhas. As I said in my first Rio de Janeiro Carnival post, you can source way stronger and larger cups for the same price or less outside. It’s so easy to get stuck in your hostel, but my biggest tip is just get out of your comfort zone and enjoy the atmosphere around. There really is no other party like Rio de Janeiro Carnival! 4. Bring all your glitter with you! Is it just me or does everyone else bring the worst things away with them? Even after 10 years of travelling, I still don’t know the secret of packing. It’s so difficult to pack for a long-term trip, even more so when Carnival is involved. Are you really going to wear that purple glittery dress again after Carnival? No and I definitely did not. So what do you bring? GLITTER! It doesn’t matter what you wear, as long as you are covered in glitter and feathers. You will fit in perfectly at Rio de Janeiro Carnival. I just wore my usual party attire, some snazzy shorts and a top. I dressed it all up with a feather headpiece, a gold coin crown and lots of glitter! Without a doubt, you should definitely get involved in dressing up. Release your inner child and think of that fancy dress you’ve always wanted to do. It’ll go down a storm here. We saw groups of pirates, mermaids, M&Ms, highlighters, pineapples, and anything with feathers! You can bring supplies with you from home, or you can find almost anything you need at the Mercado do Uruguaiana. If you are wanting to experience Carnival in other parts of Brazil, you can visit places such as the colonial town of Ouro Preto, MG and colourful and vibrant Salvador, Bahía for more authentic festivities. Apparently a lot of locals actually leave Rio de Janeiro during Carnival weekend to escape the mass crowds and many tourists take their place. I didn’t actually spend much time with other tourists, however I would be interested in seeing what another city can offer as each place celebrates in their own style. Salvador has a great hostel, Galeria 13 and it is right in the heart of Pelorinho where the street parties are incredible. Even on a normal Tuesday evening when I arrived here, not even during Carnival, we were pushed out of the door and into a party. Salvador is famous for its drumming. We had the drummers from Michael Jackson’s ‘They don’t care about us” video lead the way round these cobbled streets, as we followed with beers in hand. 6. How long should you stay in Rio for? We arrived into Rio on the Tuesday 21st of February 2017. We spent our first couple of days relaxing on the beach and getting the lay of the city before the craziness began. The best way to do this is taking a free walking tour. I recommend Rio Free Walking Tour, they were fantastic and so knowledge about their city. We were shown around the centre and into Lapa. It’s also a great way to meet new travellers as well. We had our first week booked in advance at Books hostel in Lapa. From the Thursday night, street parties had already begun. On the Friday the whole city shut down and the streets filled with thousands of party goers and parades. The Rio de Janeiro Carnival weekend was in full force. It wasn’t until we left 10 days later that the city began to return back to everyday life. The tutus started to vanish, exchanged for suits and ties as people slowly went back to work. I would recommend arriving to Rio the weeks before the Carnival weekend so that you can still get a feel for the city and what it is really like outside of the festival. It is like a fairy tale world for at least a week once the Carnival starts. We stayed for 10 days and that was a good amount of time to experience Rio de Janeiro Carnival. After a weekend detox in Ilha Grande, we did come back to Rio to finish all of our sight seeing, such as Pedra do Gavea and Parque Large, for another 4 days. If you are staying in Rio for longer, definitely visit the Sambadrome the weekends prior to Carnival. You will be able to see the spectacular shows for free as the samba school competition whittles down to their finalists for the big weekend. After speaking to some locals, street parties start from New Year and continue until the end of Carnival! I would definitely recommend you book your hostel a few months in advance as they fill up very quickly. Some demand full payment in advance and others a higher deposit. This is normal so don’t worry, as long as you are booking through certified sites, like Hostelworld, or directly with the hostel. I did not really enjoy staying at Books Hostel, as it is over priced during the celebrations and guests preferred to party in the hostel instead of at the street parties. I didn’t feel that it really offered a great experience for Carnival. It’s brilliant for younger travellers as it’s a great party hostel and I’m sure it’s better for any other time of the year. But for me, I couldn’t really meet anyone to go to the blocos with as many stayed in to party. I didn’t find it as social in that aspect, which I was looking for as I had just arrived and wanted to meet people. My one piece of advice if staying near to the beach is just be careful in the evenings. There was a lot of talk of robberies late at night by the beach, so just take extra care here. 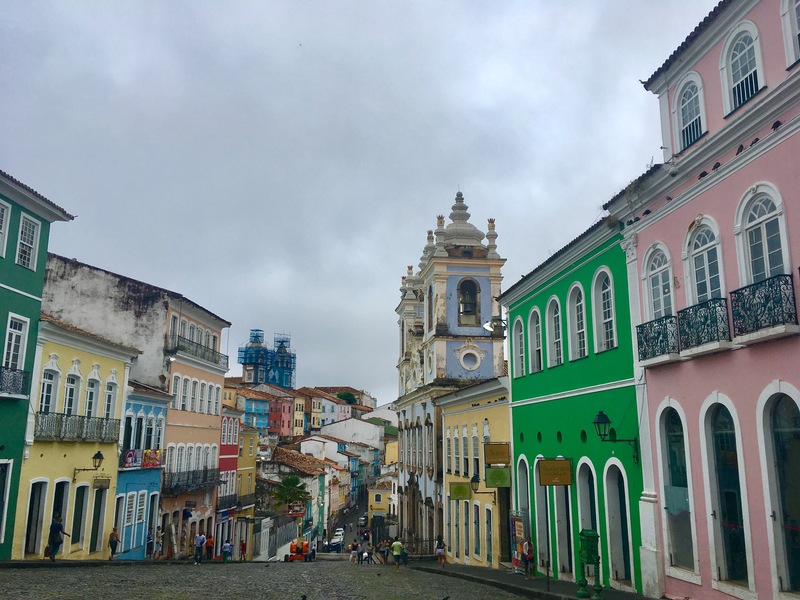 You can read about why I loved staying in Lapa so much here. After our first week in Books, we moved to another area of Rio, in Botofogo, where 2 friends had been staying. We actually ended up spending a lot of time there as locals flocked to their bar and blocos pushed passed their gates. Contemporaneo Hostel in Botafogo was a much cheaper option and had incredibly friendly staff. They were so keen to show us a good time and had friends come round to the bar and hosted great parties. It was an amazing way for us to witness more samba dancing and for them to laugh at our attempts. I loved this hostel and would highly recommend staying here. Wesley who works there is so much fun and can tell you the best places to go out to eat, drink and party. 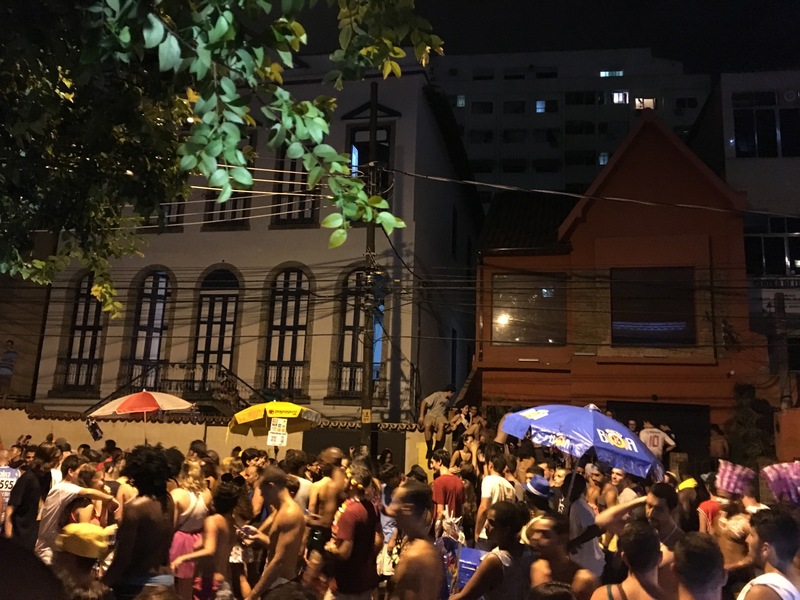 The hostel is close to Botafogo metro station giving you quick and easy access to Lapa and Ipanema – 2 of the best spots to celebrate Rio de Janeiro Carnival. It’s fairly easy to get around Rio throughout Carnival, just a little slow. The metro runs 24 hours and is almost an event in itself. Everyone is chanting and singing while riding up and down the escalators. Some stations require prepaid cards, such as Carioca in the Centro. This is one of the closest metro stations to Lapa. There is also Cinelandia but this station was sometimes closed late at night. Before you enter, you can purchase a prepaid card from a separate queue outside the station. These have a minimum load of R$5. Other stations have people manning the ticket offices inside, such as Botafogo station. Here you can buy a single or a return ticket. A single costs a fixed price of R$4.10 and you can go on multiple journeys at whatever distance. Once you leave a station you must purchase a new ticket to reenter. There are also Metro Bus services at certain stations, which you can use a Metro Superficie card. You can buy these in the metro stations or on the bus. One of my biggest tips would be to leave all valuables at the hostel when going to the street parties and blocos. Take R$20 cash and throw yourself into the hordes of people. If you have nothing to loose, you have nothing to worry about. I unfortunately was wearing a gold necklace. On my way home I was zigzagging over and under people’s arms. I felt one guy push me under, exposing my neck and I felt a very hard tug as he snapped my gold necklace off and ran away. There is not much you can do when it all happens so fast and hundreds of people are squashing you. You just have to move on and accept defeat. I never took my iPhone out with me or my debit cards. Opportunists are everywhere and can ruin your experience just like that. It could have been a lot worse but it’s a lesson to be learned from. My main warning would be to avoid wearing or taking anything too flashy or valuable out with you. Especially if you would be gutted about it being stolen. All I carried with me was a bum bag. I mainly had some make-up, glitter and some cash for drinks and metro passes. All I carried with me was a bum bag and of course the pineapple! RIP my beautiful gold necklace. Are you as terrified as I am of dancing? Who cares!! Nobody knows who you are and if you do it with a huge smile on your face, you will look as if you are having the time of your life, even if you are completely cringing on the inside. Samba is probably one the most difficult dances I have had to attempt so far on this trip. But then the Brazilian guys are probably the most beautiful ones to ask you to dance in Latin America, so what do you do? Você fala português? No I don’t either, but after a lot of cachaça I swear you’re practically fluent. A lot of the locals will want to practice their English or just want to chat to you. Don’t be shy and give Portuguese your best shot and you’ll make lots of new friends and hopefully an incredible Rio de Janeiro Carnival. 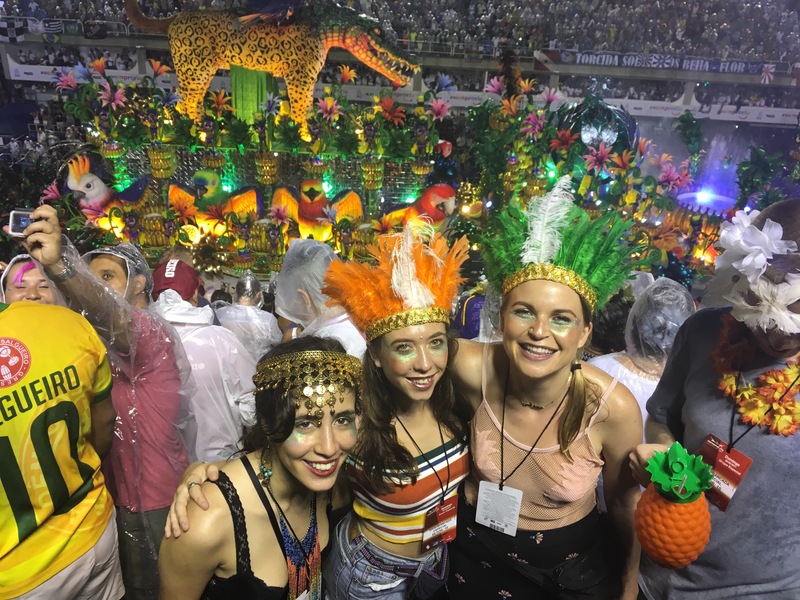 If you have any questions about Rio de Janeiro Carnival and if you’re planning your trip to Brazil, please feel free to contact me by subscribing to my website and I’ll be more than happy to help! If you haven’t read my post already about where the best place to stay for Rio de Janeiro Carnival is and what to expect at blocos and in Lapa, give my next post a read!